up to P292,500 worth of Gaisano Capital gift certificates. Get one (1) raffle coupon for every P500 worth of purchase and P20,000 for wholesale (single or accumulated receipt) from the Supermarket and Department store. Promo runs from September 1-30. Draw date is on October 1, 2018. 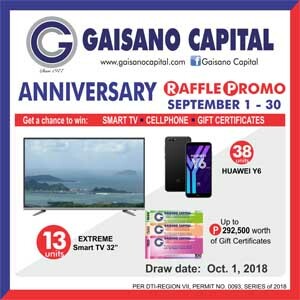 Visit Gaisano Capital store near you.